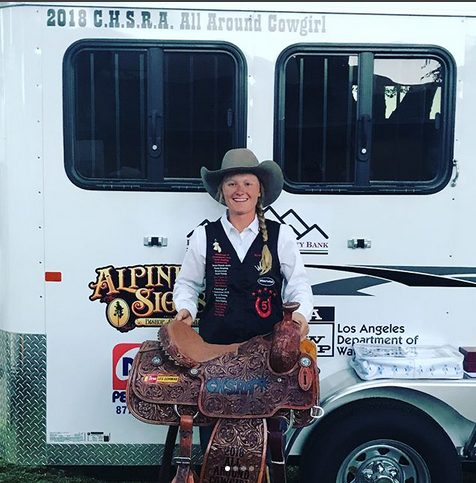 Backing into the box at the California High School Rodeo Association (CHSRA) State Finals, Rylee George had qualified in four events and was also District 5’s All-Around Cowgirl. But, she wasn’t going to end her year with just those titles – she would departure her junior year being crowned as the 2018 State All-Around Cowgirl and State Champion Header. “It feels incredible to win All-Around at State,” George expresses. George and her partner, Karson Mebane successfully roped four head with an average of 50 seconds, taking home the State championship title and securing the first spot in qualifying for National Finals in Rock Springs, WY, July 15-21. This is the first year the ropers have competed together in high school rodeo. Rodeoing has been an important aspect of her life since she was five years old. In August, George will be a senior at Oakdale High School. She competes in the pole bending, goat-tying, breakaway roping, team roping and barrel racing. Coming into State Finals, she won the breakaway roping ,team roping, second in barrels, sixth in goat tying and the All-Around Cowgirl title. We are proud of you and will be rooting for you at Rock Springs! You make California proud, cowgirl! Express to me how it feels to be the State champion header? Being the State champion header feels pretty great. I’ve never won State in team roping before so to be able to win it feels like I am one step closer to accomplishing my life goal. What was your average in the breakaway? My average in the breakaway roping was about 16.5 on four head. My other accomplishments are winning the breakaway roping my 8th grade year at Junior High Rodeo State Finals. And, I’ve won 21 saddles. What is your favorite rodeo event and why? My favorite rodeo event is the team roping because it is challenging to figure out how your partner may like the steers handled. Also, it teaches you to work as a team, to make the dream work. What do you feel is your biggest challenge you face when competing? My biggest challenge when competing is not letting the nerves get into my head and make me overthink things. Jackie Crawford inspires me because she works hard for what she wants and she excels in multiple rodeo events. I have two head horses that helped me make it to State. The first one is named Rio, who is a 12 year old Dun gelding, with a lot of run and a big move. Second, is Nick. He is a 12 year old Palomino who scores and faces well. Dakota is my breakaway horse. She is black and seven years old - I’ve had since she was three. Any roping or rodeo goals? My rodeo goal is to qualify for the NFR one day. How about your career goals? I want to work for an animal nutrition company and make new grains and supplements. Four things on your bucket list? “Work until your idols become your rivals,” Said by Drake.